1) Remove Wan Hua Pan Mee Noodles (Or Miki, Udon, Yakisoba, or Vegetable Noodle) from the package and gently separate. Set aside. 2) Heat oil in wok until almost smoking. Add the garlic and Thai chilli peppers and stir-fry quickly until fragrant, about 30 seconds. Add meats (Cooked Tofu may be added later) and stir-fry until fully cooked. 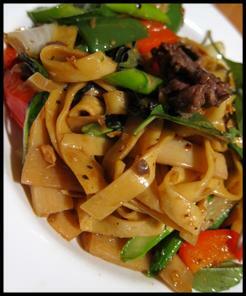 3) Toss in onions, bell pepper, and bamboo shoot. Then stir-fry until tender. 4) Add the entire package of noodles into pan, then add water to soften noodles. 5) Add fish sauce, oyster sauce, sweet soy sauce or sugar, and tomato into pan. 6) Stir-fry all ingredients together until mixture is completely heated through. Turn off the heat and add Thai Holy basil leaves to mix well into pan.